Despite 2015’s freakishly warm holiday weather, winter is one of the worst conditions to endure. That’s why the US military has courses designed to teach its people how to survive in arctic temperatures. Here are a few tips from the Winter Survival Course handbook and some items the Marine Corps consider essential to combating the cold. Here’s what the Marines say to take with you if you venture deep into the cold (somewhere other than New York) this winter. Water/Food: At least a few gallons of water is advisable in harsh conditions. Fire-starting material: Flint, matches, or a lighter. 550 Cord: This gets its name from the weight it can bear. 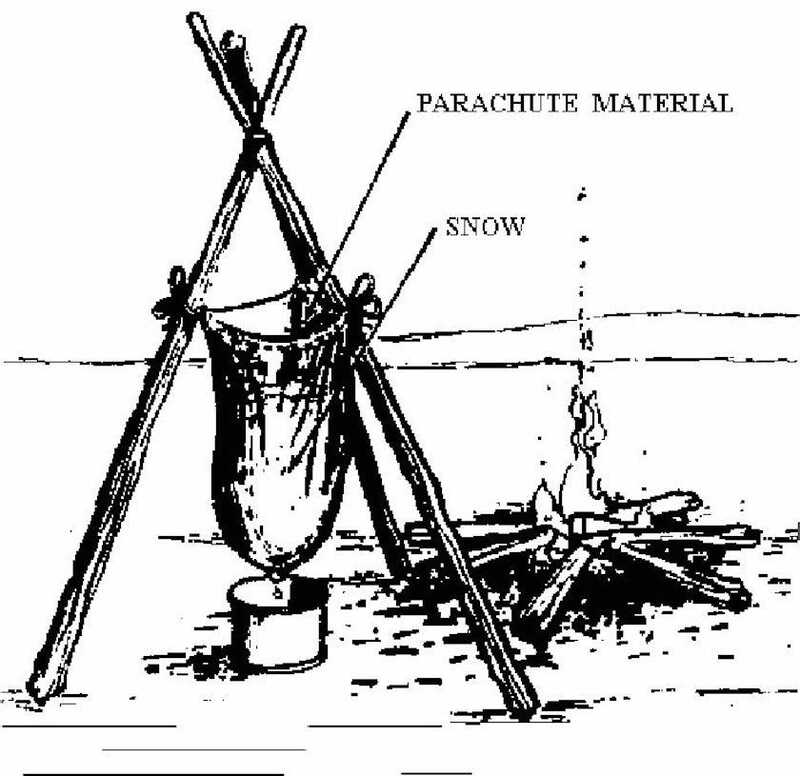 Good for making shelters, trapping animals, and treating wounds. A metal container: For boiling water. It’s not safe to eat mass amounts of snow off the ground. Must be a non-petrol carrying container. Kill two birds with one stone and carry a can of beans. Tape: Electrical or gorilla duct tape has near-infinite uses. A knife and/or multipurpose tool: Some of these actually contain a flint. A mirror: For signaling. In a pinch, a makeup mirror will suffice. Staff Sgt. 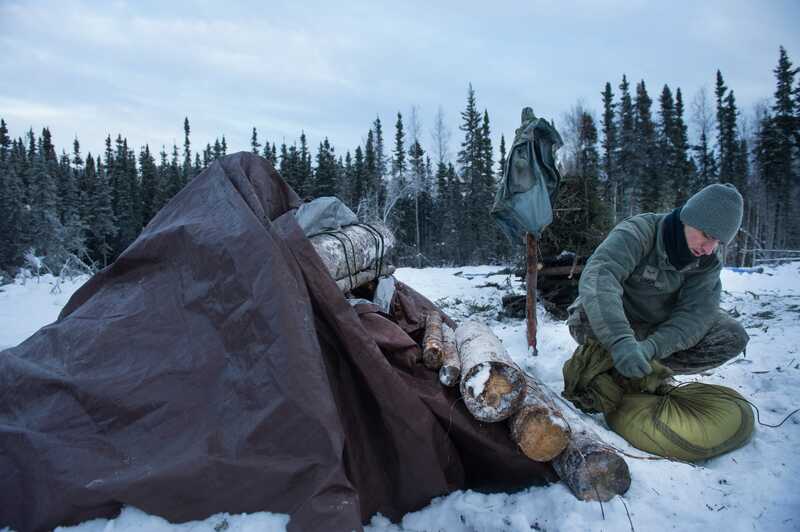 Vernon Young Jr./USAFAirman 1st Class Ray Simon prepares the cover for his thermalized A-frame shelter during arctic survival training at Eielson Air Force Base, Alaska. The A-frame shelter is designed to keep the survivor warm and dry to endure harsh arctic nights. Simon is a 3rd Maintenance Support Squadron crew chief. Planning: First you have to assemble your kit. If it’s mobile, make sure it’s kept in a water proof container or bag. Shelter: If you’re in a car, don’t leave it. 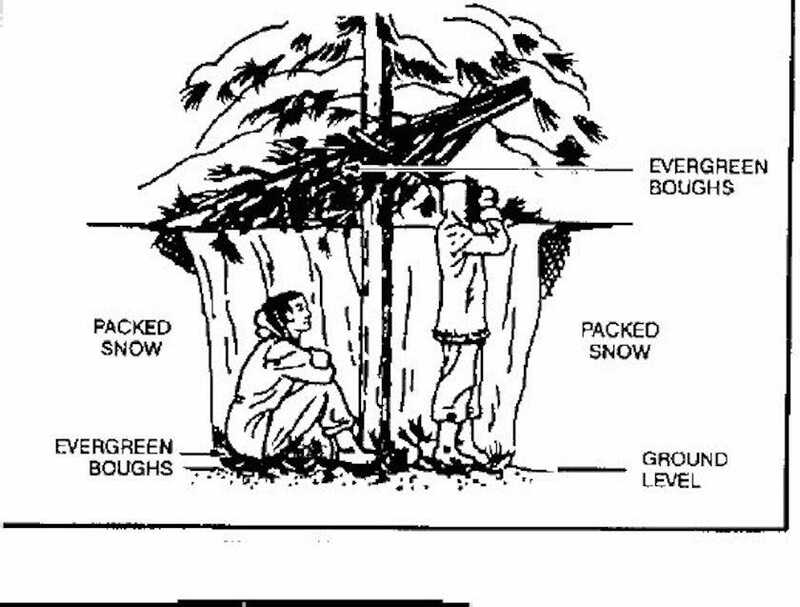 If you’re on foot, build a shelter, or find one: Finding shelter is the paramount consideration when stranded in extreme weather. Hollowed-out logs can be cleaned out and enhanced. Caves work as well. Reduced living space means warmer living space. Beware of occupying animals, and consider ventilation. Start a fire: And plan to maintain that fire. Dig a hole and use dry pencil-thick branches and evergreen limbs as kindling. Evergreens burn fast and hot. Fuel should be thicker limbs that have broken off a tree — found near the ground, but not submerged in snow. Now for the second 24 hours. Find water: Nearby lakes and rivers are great but snow and ice will do. Ice is better because it has a higher water content by volume. Conserve food: Given that you told people where you were going, they’ll be out looking for you within a day or so. Catching food in the wild is not difficult though. 550 cord (or better yet, fishing line, if any is handy) can be used for snares. Paper clips, hairpins and sewing kits all yield hasty fishing hooks. Here’s a brief how-to on building a quick snare. Improve survival conditions: This doesn’t just mean upgrading your shelter with new additions. It also means preparing to be seen by anyone looking for you. Prep a platform of dry interlocking green limbs to be set ablaze at a moment’s notice, and bright pieces of clothing or material could be placed in visible places. This post is originally by Geoffrey Ingersoll.